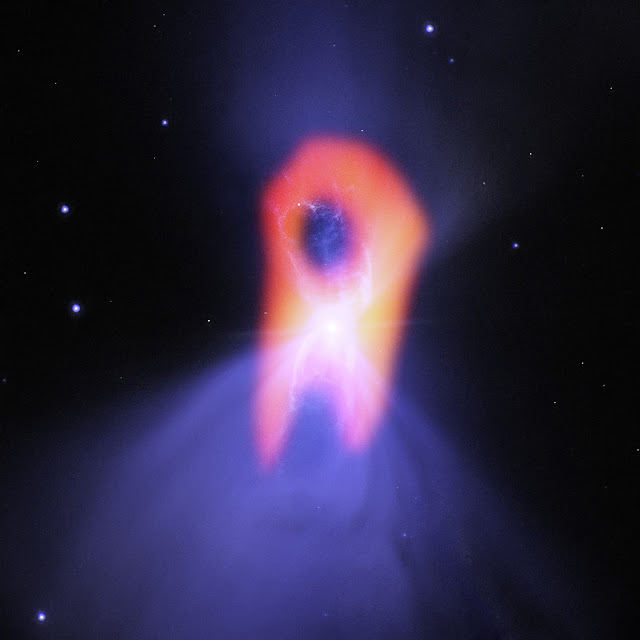 This picture shows the Boomerang Nebula, a protoplanetary nebula, as seen by the Atacama Large Millimeter/submillimeter Array (ALMA). The background purple structure, as seen in visible light with the NASA/ESA Hubble Space Telescope, shows a classic double-lobe shape with a very narrow central region. ALMA’s ability to see the cold molecular gas reveals the nebula’s more elongated shape, in orange. Since 2003 the nebula, located about 5000 light-years from Earth, has held the record for the coldest known object in the Universe. The nebula is thought to have formed from the envelope of a star in its later stages of life which engulfed a smaller, binary companion. It is possible that this is the cause of the ultra-cold outflows, which are illuminated by the light of the central, dying star. ALMA looked at the nebula’s central dusty disc and the outflows further out, which span a distance of almost four light-years across the sky. These outflows are even colder than the cosmic microwave background, reaching temperatures below –270 °C. The outflows are also expanding at a speed of 590 000 kilometres per hour.